Here is the next post in my series of entries previewing the 2012 tennis season… I have already stated who I think will win the majors; now I give you my predictions for the top 10 in the WTA rankings at the end of 2012. Like this year, I expect the ranking points to be pretty evenly shared out and I still don’t see a really dominant figure on the tour like Novak Djokovic on the ATP tour this year. 1. Petra Kvitova – Kvitova is my tip to be world number one at the end of 2012. Last year she had a terrific year claiming her first Grand Slam title at Wimbledon and finishing off the season in style at the YEC in Istanbul. I anticipate Kvitova to build on the success of 2011 with more consistent results helping her to the top spot. Last year, she posted a number of poor showings throughout many of the tournaments in the US and although I don’t expect her to be anywhere near the dominant player in the heat and humidity, I think she will definitely improve her results. In the Grand Slams, I expect her to post solid results highlighted by another Wimbledon title. 2. Victoria Azarenka – Azarenka had an extremely consistent 2011 and all the signs suggest 2012 will be no different. I believe a number two showing next year will include much stronger performances at the slams, in particular the US Open. I’m still wary of whether she can actually win a Grand Slam because i’ve predicted it for the last three years to no avail! I hope Azarenka manages her schedule well because it is rare you see her produce excellent performances week in, week out as she is prone to niggling injuries… nonetheless, I am confident she will be very near the top of the rankings in 2012. 3. Serena Williams – Starting the year fit and healthy will give Serena the opportunity to break the top 10 again and she ranks in at number 3 in my predictions. I predict Serena to be the most successful player at the Grand Slams this year including the title in Australia and a runner-up showing in Wimbledon. However I cannot put her any higher because it is likely she will play a limited schedule, missing tournaments such as Rome, Montreal and the Asian swing, which all carry a large amount of ranking points. I am hoping to see some great showdowns between Serena and Kvitova next year in what I think could become a great rivalry on the tour. 4. Sam Stosur – I think Stosur will continue to assert her new-found confidence and rise to her highest ever ranking of number four. Stosur will be a real danger on the clay and I predict she will score a large number of her points in this part of the season at the tournaments in Charleston, Rome and Madrid before claiming the title at Roland Garros. Stosur was highly inconsistent in the first few months of the 2011 season so she has a great opportunity to stack up the points before she returns to Flushing Meadows to defend her title. Stosur has a fantastic game headlined by her kick serve and thumping forehand. She demonstrated her improved mental toughness this year, which will make her a threat to the top players on tour in 2012. 6. Caroline Wozniacki – I will be extremely surprised if Wozniacki hangs onto her number one ranking for long, as she ranks at number 6 in my predictions. Wozniacki has taken on Jelena Jankovic’s former coach, Ricardo Sanchez which I find a rather strange appointment. I’m sure Wozniacki will continue to be the epitome of consistency producing solid results in the lesser tournaments. However, unless she can bring an attacking and more powerful edge to her game and maintain an element of consistency at the same time (not an easy task!) she isn’t going to win a major anytime soon. 7. Andrea Petkovic – Petkovic had a breakthrough year in 2011 and I believe she will continue to produce some consistent results in 2012 moving up several places next year. I think Petkovic has the consistency in her game to potentially reach a Grand Slam final next year and i’ve marked the US Open for this. My only worry is how her knee will hold up… it let her down towards the end of this year following a gruelling schedule and I wouldn’t be surprised if she had a spell on the sidelines during 2012. 8. Agnieszka Radwanska – Radwanska was the in-form player at the end of 2011 claiming the titles in Tokyo and Beijing and producing a courageous performance at the YEC… I think she will maintain her top 10 ranking, but I still question whether she has the power to beat the likes of Serena, Clijsters etc. I think last year has given her a great deal of confidence including breaking the barrier of not winning a title in 3 years. I anticipate she will win several tournaments again this year; however I don’t see her going any further than the quarter-finals at next year’s Grand Slams. 9. Anastasia Pavlyuchenkova – Pavlyuchenkova is my first of two new entries into the top 10 for 2012. Pav has been banging on the door for several years now, but has yet to make that big breakthrough and maintain her consistency throughout the whole season. Pavlyuchenkova has so many issues with her game, yet she is still at number 16 in the rankings, which highlights her potential! She is one of the cleanest ball strikers on the tour, but a big factor will be how she has worked in the off-season. There will need to be big improvements to both her serve and movement for this top 10 prediction to come true! 10. Sabine Lisicki – I anticipate Lisicki to finish 2012 in her highest ever ranking and rounding off the top 10. Lisicki made a superb comeback to the WTA tour this year after being out with injury during much of 2010. She peaked this year in the middle of the season with a semi-final run at Wimbledon and a solid summer hard court season. Lisicki has very few points to defend early on in the season and will be a dark horse in Australia using her much elevated current ranking of 15. She has a powerful game that has the potential to reach the top 10; however she can go walkabouts in her matches and will need to eliminate the mental lapses that flared up several times in 2011. I predict that Li Na, Vera Zvonareva and Marion Bartoli will exit the top 10 in 2012. Li Na‘s form at the end of 2011 was woeful and it marked an alarming drop in confidence following her triumphant run at Roland Garros. The loss of Michael Mortenson as her coach was also a disappointing move from the Chinese player as he brought so much to her game. She has some huge points to defend in 2011 and I expect her to be languishing around the 20 mark in 2012. Many people expect Vera Zvonareva to remain in the top 10 in 2012, but for some reason I disagree! She showed at the YEC in Istanbul that she still has some alarming mental weaknesses. I predict that Zvonareva, along with Marion Bartoli will be positioned around the 15 mark in the rankings. I predict that both Francesca Schiavone and Jelena Jankovic will suffer significant drops towards the 20’s and 30’s. Jankovic still has the talent, but will need a big win in 2012 to recover her shattered confidence. As much as I like Peng Shuai, I am worried she has peaked in the rankings and I hope that her loss of form at the end of 2011 was a sign of tiredness. Julia Goerges should also fall with a large number of her points coming from a terrific clay-court season; she has shown the talent in her game, but also the inconsistency too. It is a tough ask to determine who is going to make the jump up the rankings like Kvitova and Petkovic did in 2011. After watching some of her matches at the end of 2011, i’m predicting that Christina McHale will have a superb 2012 and end it in the top 15 of the rankings. I also predict that this will be a better year for Ana Ivanovic who has shown signs that she is returning to good form after some impressive wins in Beijing and winning in the final tournament of the year in Bali. I think she will be on the cusps of the top 10 and have reached at least one Grand Slam quarter-final in 2012. I also predict big things for Carla Suarez Navarro and Mona Barthel. Suarez Navarro has been plagued with injury in recent years, but has a fabulous game and started to put some excellent results together at the end of last year. She has reached the Australian Open quarter-finals before and I predict another Grand Slam quarter-final this year on her way to breaking the top 20. Barthel has shown promise on the ITF Tour and I hope to see her play more WTA tour events next year… I think she will break the top 30 in 2012 along with a fully fit Zheng Jie. I expect British hopes to be raised as Heather Watson and Laura Robson break the top 50 along with the American, Sloane Stephens. I know this article is all about speculation, but I do love predicting what is going to happen and then looking back to see whether ANYTHING I predicted was correct!!! 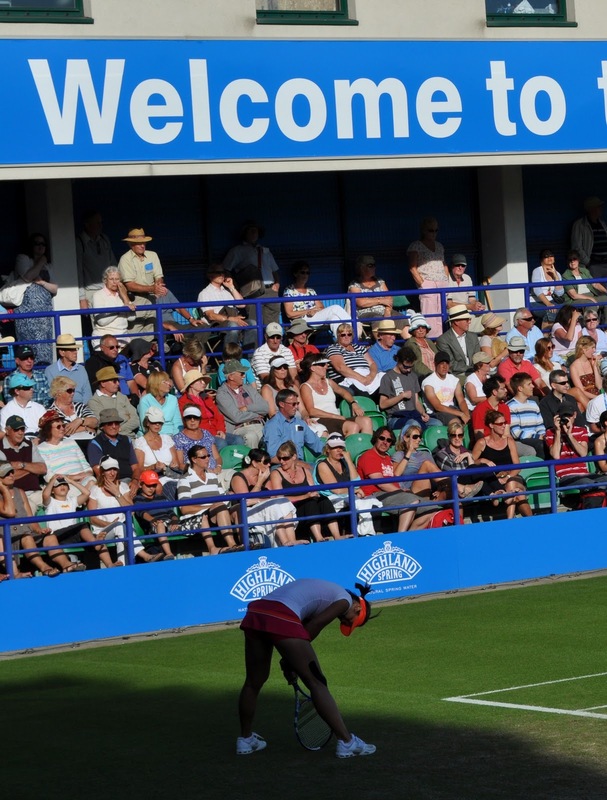 What are your predictions for the WTA tour in 2012? December 14, 2011 in Azarenka, Barthel, Ivanovic, Kvitova, Li, Lisicki, McHale, Pavlyuchenkova, Petkovic, Radwanska, Serena, Sharapova, Stosur, Suarez Navarro, Wozniacki.